After taking a look at the types of institutions for which Records Management Section members work, I decided to look at the same February 2019 membership list to determine where we live. (Or work — looks like some folks live in one place and work in another, and it’s not obvious from the data which address was entered.) 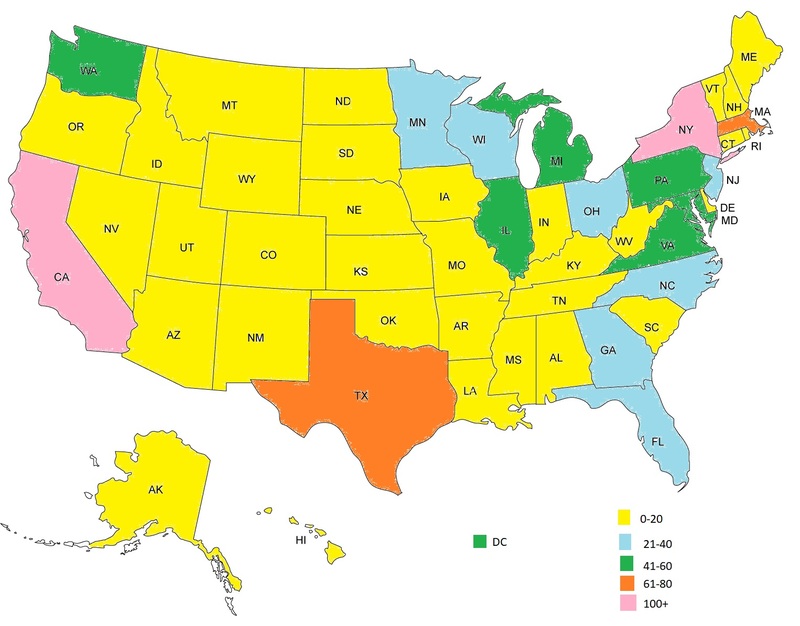 Once again, there are gaps because some members didn’t enter addresses; where possible, I identified the state if it were obvious from the institution listed. 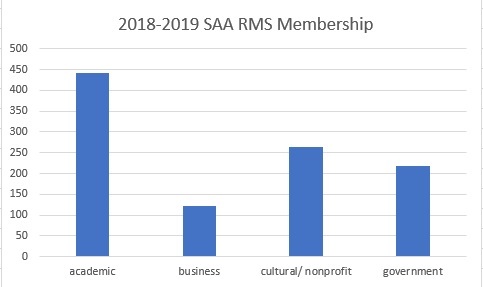 In honor of Records and Information Management (RIM) Month, I did a little analysis of the membership of SAA’s Records Management Section. I began this project in February by looking at the members signed up for the Records Management Section on SAA’s Connect community. At that point, there were 1,324 members. academic — This includes anything with school, college, or university in the name including affiliated medical facilities. Many registrants list only the top level in their company name, so I made no attempt to differentiate between those who work at a university archives vs. those who teach vs. those who have some other role at a university. cultural/nonprofit — This includes archives, libraries, and museums that are not affiliated with academic institutions along with historical societies and religious organizations. government — I tried to make educated guesses about which entities are government-funded vs. those that are private organizations. Although some academic institutions are also government entities, they are only counted in the academic list. I’m happy to report there are now over 1,500 members registered for the Records Management Section. Let’s keep growing! Stay tuned to this blog as well as the listserv for more nods to RIM month. We can charge back ‘reasonable’ search fees over $50 for public records requests: true, but is doing so good customer service? The City Clerk’s office is trying to push the idea of cutting through red tape to allow the public to work more easily with government, so this argument resonated, I think. Plus, of course, Wisconsin State Law prevents us from passing on redaction/review costs to the requestor, so any time spent on that because of inadequate information screening was a cost the city had to eat anyway. Email (and probably eventually texts) is physically managed by a SaaS provider. This kind of threw my “costs of running the server, costs of paying someone to run the server, costs of maintaining good digital preservation practices” arguments out the window, since Microsoft includes unlimited(!) email archives storage space with the package that the city purchased. I decided to leave the question of the environmental cost of storage to another day, but I was able to point out that “unlimited” really meant “unlimited until you reach an arbitrary cap, or the vendor decides to change the terms of service” (I think we’ve all had a bait-and-switch ‘unlimited’ mobile data plan…). Beyond that, if the City ever moved on to a new system, the cost of migration would suddenly bring the size of the email archives to be brought over into sharp relief. So much for the written component. Now I had to prep for the meeting and make my case for appropriate retention schedules. I did an informal environmental scan and quickly determined that some sort of two-tier retention scheme was going to be the only way to manage the vast quantity of texts and emails that would need to be addressed. Using examples from the State of Wisconsin, the newly-approved Wisconsin municipal records schedule, and NARA’s Capstone model, I put together the below chart comparing solutions, and paired that with a couple of sample schedules to bring to the meeting. Fair enough… but once we got to the meeting, I ran into continued resistance to implementing any of my suggested solutions. IT didn’t want to get into the business of classifying texts and emails; legal was concerned about the transition from the active system to a separate archive down in City Records; my team doesn’t really have the time or skillset to review texts to the extent needed; none of us were confident that we could leave records declaration or classification to users. We decided that as a first step, we would try to submit a schedule giving all text messages a retention of 6 months, on the theory that that time period would give us time to put holds on relevant texts, but would not require us to hold onto the irrelevant ones for too long. I was all set to put something together, but there was one hitch: I was asked not to include my standard disclaimer for series like this, “if a record is associated with a series governed by another schedule, retain it according to that schedule.” The consensus was that the disclaimer would be confusing to end users and would not be followed in any case, and that I should submit a straight 6 months schedule and hope for the best. I am, sadly, not as cool as Jeff Goldblum, but it’s still an appropriate GIF. ….Reader, I tried. I really did. I solicited advice from other records colleagues in Wisconsin; I asked around the Records Management Think Tank for their experience with scheduling texts under a restriction like this; I sent out requests to the RMS list and to Twitter for more policies. I couldn’t find anything that supported a *blanket* 6-month retention for all texts. As I wrestled with the language for a single schedule, I thought back to the Matthew Yglesias article about exempting email from discovery that I so thoroughly mocked on this blog lo these many years ago. If every text is retained six months, with no consideration for content, what stops people from using texts for everything, with a high likelihood that evidence of questionable texts is erased from the City logs after a certain period of time? At the same time, how can anyone possible go through all of the texts being sent by city employees to determine value? I decided at this point to play the same percentage game that NARA is playing with Capstone for emails—the significant/historically important texts, such as they are, are more likely to originate from accounts higher up in the hierarchy, so it makes sense to retain those archivally (possibly deaccessioning later through use of machine learning or similar); the rest could stay at 6 months. As such, when it came time to submit schedules, I turned in not one text schedule, but two—one for Elected Officials and Critical Staff, and one for everyone else. Here’s your takeaway for today’s installment: do not blindside your stakeholders on schedule creation. In retrospect, I absolutely should have held on to those schedules until such time as I had a chance to consult with the relevant parties and explain to them why I thought one schedule was so problematic. I suppose I was anxious to get something through the approval process, which can take up to 6 months between City and State approval, which is why I didn’t wait, but the effect of my impatience was to anger EVERYONE involved. The CIO was annoyed because of the technical capacities that I assumed in my schedules (IT had since decided not to pursue a contract with the vendor of the solution described). The assistant city attorney was annoyed because he thought I overstated the ramifications of having only one schedule for all text messages. Everyone was annoyed because I made this change unilaterally and submitted it for approval without so much as a by-your-leave. I own it—this was absolutely an unforced error. I 100% should not have rushed to get something/anything approved without checking in with the stakeholders about major changes. I stand by my reasoning for putting in a two-tiered schedule for text messages, and I did not withdraw the schedules at that time, but I almost certainly poisoned the well for getting the schedules actually approved by CIMC. Principles and best practices are all well and good, but they don’t do anyone any good if they alienate the people you need to sign on in support. Plus, of course, as it stands the retention of text messages is sort of the Wild West, so I’m not doing myself any favors delaying it for that reason either. Next time (tomorrow? ): Brad tries to make up for lost ground, plus the followup meeting/discussion and where we go from here. *Possibly the first time anyone has referred to a records manager as “intrepid”. Definitely the last time. Welcome to RIM Month! I have been promising/threatening my fellow Steering Committee members to write this post for a while now. My ability to write it, however, has been significantly impacted by the extent to which I have been absolutely BIFFING the process. Stakeholders have been angered; records management best practices/commandments have been violated; capstone models have been altered; hair has been pulled out in frustration; records managers have been called on the carpet*. The worst part is that it’s not even done! I’m at, at best, a holding pattern to a point where I can maybe, MAYBE submit a schedule to be approved by the state board next quarter. The frustration continues. The tl;dr of the below: Scheduling electronic messages is COMPLICATED, particularly in the public sector. You are walking a fine line between the dictates of the historical record, the operational needs of the organization, the technical capacity of your IT department, and the political/legal considerations of the public officials affected. These four factors are, more often than not, diametrically opposed (yes, there’s four of them and they’re ALL diametrically opposed; that’s how complicated it is). I, frankly, did not walk the line very well. If we represent the hazards as shark tanks on all sides, I am currently on dry land, but bloody and scratched and missing some chunks. So: Learn from my mistakes! Don’t go charging in without considering the ramifications! This is a case where “better to ask forgiveness than permission” definitely does not apply. This is, as per usual, going to be a long one; I’m probably breaking it up into at least 3 installments. For the purposes of this blog post (and what I was actually focusing on), I am going to refer specifically to scheduling text messages below, but the lessons learned can apply to emails, social media, and other forms of electronic communication as well (and, to a certain extent, to all formats of record). Read on after the jump. The following is a RMS guest post by Maarja Krusten, a retired Federal government historian who worked on records, archives, and historical research assignments and served for 14 years as an archivist in NARA’s Office of Presidential Libraries. Margaret M. H. Finch once said that working with permanently valuable Federal records made the people described in them “almost become living people.” Who was Finch? And what provides context for her own story? Records! After the death of her husband in 1918 during the influenza epidemic at the end of World War I, M. M. H Finch joined the Pension Bureau. She became a branch chief and top expert in the pension records of the Revolutionary War and the War of 1812. In 1940, the Pension Bureau transferred the records to the National Archives. Mrs. Margaret M. H. Finch worked for the National Archives from 1940 until 1949. Image Credit: National Archives and Records Administration Facebook Page. The research I’ve done on the construction of office buildings in Washington, DC. enhances and provides context for Finch’s story. The National Archives holds textual and photographic records from the Commission of Fine Arts (Record Group 66) and the Public Buildings Service (RG 121). These include a wonderful photo taken in 1940 of the Pension Building where Finch once worked. I tweeted the photo in 2017—note my inclusion of the source information! We can use such stories to show why records matter. Records managers ensure the proper disposition of records, including the retention of those that have historical value. But information professionals know that the people they serve in academic, corporate, government, and other offices are busy with day-to-day mission work. Where do employees hear about what is happening with records created outside their employing organizations? Sometimes, it’s in a negative context—a data hack, the leak of internal documents, controversies over who said what and when. But there are positive examples out there, as well. And not just in the history books some of us love to read. I’ve been thinking about that in the context of working many Education and Public Programs Division events at the National Archives and Records Administration. Some relate to temporary displays, others to long-term exhibits, such as “Remembering Vietnam,” which ran November 10, 2017 to February 28, 2019. I met many Vietnam war veterans over the course of the last year as I helped staff programs related to the exhibit. I found seeing veterans reconnect with their past experiences through the records shown in the exhibit and displayed during panel discussions deeply poignant. Last February I talked to visitors to the National Archives Museum about the Emancipation Proclamation. It’s a fragile document displayed only once a year, at most, and then only for three days. I especially enjoyed the questions from students, one of whom pointed to a faded circle on the last page and asked if someone had set down a cup of coffee! A great opportunity to talk about conservation—not just the iron-based ink, but why the seal and ribbons at the top of the last page deteriorated over time. And why President Abraham Lincoln signed his full name., not just the A. Lincoln he used in routine documents. Employees participate in records management training sessions in-person or online. But unless they work as historians, policy analysts, lawyers, or in other knowledge-dependent functions, they may not have time to think about why saving historically valuable records is as important as destroying or deleting ones that only have short-term value. Sure, they may see news of an important records release by the National Archives. Or they go to see exhibits in archives, museums, historical societies. But they may not think about the insights records preserve about their own places of employment. Let’s help them see that their stories matter, too. Whether we work in academic, corporate, or governmental settings, we can look for stories about the places where we work. And use them to bring the past to life. By providing interesting historical information about the construction of the buildings in which they work. Or how the employing organization’s workplace evolved over time. And what it took to make change happen. To connect past and present. And to remind employees that they are part of a valuable through line. One that stretches from those who came before to those who will follow. Preserved for future use by records managers–and those who support them. One of my best friends is a proponent (albeit somewhat selectively) of radical honesty. Perhaps I’ve been spending too much time with him recently, but here goes: I have been contemplating a professional life beyond traditional records management. *RECORD SCRATCH*. Huh? Does he know what this blog is about? Don’t get me wrong – I enjoy the archival and records management profession a lot. The work is interesting, challenging, and (most days) rewarding. I’ve developed many friendships and connections over my eight years in the field, from which I’ve grown personally and professionally. I would consider myself fortunate to continue to advance within the field. However, lately I’ve been wondering what the retention period is (had to folks) for someone in my position. As university records manager at a major research university, how do I advance? Am I making an impact? How can I prepare myself through training or further education to reach my career goals? What are those goals? As archivists and records managers we do a good job of defining what types of training, experience or expertise professionals within the genre require – digital this, archival that, record thing this. Continuing to improve as a record keeping professional is top priority, certainly, and something I continue to desire. But do we talk enough about how to leverage our MLIS and similar degrees to position ourselves beyond the traditional boundaries of our professional genre? I recently thought to myself “there have to be people who have naturally transitioned from archives and records management roles to something larger, right?” I figured it would be easy to identify degree or certificate offerings that would complement my MLIS. Wrong! I was surprised to find out that identifying appropriate professional development or educational opportunities that would supplement my existing MLIS-based skill set was more difficult than I thought. Note: I’m specifically not addressing opportunities like CRM, CRA, or IGP here, one because I want to push past our profession’s boundaries and two because my current institution offers wildly good tuition benefits. This got me thinking even more. If I were to seek out professional opportunities that didn’t explicitly have “archives”, “records management”, or even “records” in the description, what would they be? What types of opportunities are we, allied recordkeeping professionals, even qualified for? Project management? Heck yeah. Grant writing. Instruction. Governance modeling. Policy creation. Donor Development. Information management. You get the idea. Admittedly, this is sort of a frightening thing to consider. I’m trained in this specific thing. I practice this specific thing. People know me (ok, some people) in the context of this specific thing. How could I leave that community, with shared interests and a collective sense of purpose? I’m not even entirely certain of the professional genre I would be interested in moving into if I put records management in the rearview. That’s part of what makes thinking about expanding out of a traditional records management role or archival setting so difficult. Nevertheless, I find myself continuing to think critically about how one can effectively build out from the MLIS without starting over. If necessary, how can one leverage the skill set acquired through archival and recordkeeping work into different professional genres? What types of training or degrees would allow this to happen in a successful way? It’s a question I have yet to find a good answer for. Maybe you have? The Records Management Section (RMS) Steering Committee exists to direct and focus the annual business of the section, as well as to foster connections and professional growth amongst section members. Steering committee members participate in monthly conference calls, lead ad hoc initiatives, and contribute to the progress of the section throughout the annual cycle. We encourage all RMS members to contact us directly with concerns, ideas, recommendations, or positives throughout the 2018-2019 cycle! Alex is the University Records Manager at the University of Pittsburgh, where he has worked for five years. He provides guidance and consultation on institutional record keeping and best practices, manages the University’s contract with its off-site storage and destruction vendor, and is currently leading a campus-wide working group in revising the University’s general retention schedule and associated policies. Alex has been a RMS steering committee member for three years. Courtney has worked as a Records Analyst at the State Archives of North Carolina for five years. In this position, she consults with state and local governmental agencies and universities on the creation, maintenance, and disposition of public records. She also works for the Traveling Archivist Program through the State Archives and serves on the publications board of the Society of North Carolina Archivists. Courtney has been an RMS steering committee member since 2015. Eira has worked as the Digital Archivist/Records Manager at the University of Cincinnati’s Archives and Rare Books Library since 2013. She served as the RMS section’s Vice Chair/Chair between 2016-2018. She was previously elected to the 2014-2015 SAA Nominating Committee, and was recently appointed to SAA’s Committee on Public Policy for a three-year term. Eira has been an RMS steering committee member since 2014. Holly is the Records Preservation Manager for Denton County Records Management in Denton County, Texas. As a part of the Department of Technology Services, the Records Management Division provides consultation, policy and compliance review, and Records Center services for the county. Additionally, Holly specializes in outreach and training for her customers. This is Holly’s first year as a RMS steering committee member, and she is excited for the opportunity to contribute to the section. As the Records Manager and Digital Resources Archivist at Williams College, a small highly selective liberal arts college located in Williamstown Massachusetts, Jessika leads both the records management program as well as collection development and preservation for digital collections. Jessika is passionate about digital personal archiving, diversifying the archival record, and working with various groups at Williams. She has been a RMS steering committee member for two years. Elizabeth is the Archivist for Records Management at the Bentley Historical Library at the University of Michigan. The position was created two years ago and marked the launch of the institution’s Records Management Program. Although Elizabeth’s primary role is providing guidance and consultation on institutional record keeping and IG best practices, she’s deeply committed to raising public awareness about a variety of record keeping and archival topics. Elizabeth is currently serving her second year as a RMS steering committee member. Hillary is the Records Manager at Duke University. As part of the University Archives, Hillary works with departments and offices to identify, transfer, and preserve Duke University’s historical and business records. Hillary has been a RMS Steering Committee Member since 2015. Brad is the the City Records Officer for the City of Milwaukee, Wisconsin. Previously, Brad served as the University Records Archivist at the University of Wisconsin-Milwaukee. He has given numerous presentations on born-digital records, digitization, and research data management for a variety of user groups. Brad served on the 2018 SAA Conference Program Committee and is active in MAC. From 2011-2014, he served as chair of the Records Management Section, and has been a RMS steering committee member for nearly 10 years. Ivy is the Digital Curator, Archivist, and Manager of Records at the Johns Hopkins University – Applied Physics Laboratory. Ivy also works as a Research Librarian at Trinity Washington University. At JHU/APL, Ivy utilizes her knowledge of archives and library research tools to access monographs, serials, photographs, and geospatial information. In addition, she performs research, and retrieves and attaches metadata to a collection of military, science and defense related records. She previously worked at the Library of Congress. Ivy has been a RMS steering committee member since 2017.